“You can't change laws without first changing human nature." For me, Unwind is the perfect book to fit into the dystopian triangle of Suzanne Collin's Hunger Games and Scott Westerfeld's Uglies series. The novel is about a horrific norm that develops in society where teenagers can be unwound and a group that decides to fight against it. I'm not a big fan of reviews that tell you to much about the book, I would rather the reader find that out themselves so I won't say exactly what unwinding is. All I can say is the more you think about it, the more 'And I Must Scream' it becomes. And the scene that actually shows the unwinding--the writing-- is seriously the best thing I have read all year. Unwind takes place a few decades after the fictional Heartland War--a war in the United States fought over the issue of abortion. Creating unwinding is the only peaceable end to this war. And let me tell you, kids don't want to be unwound. The bulk of the plot tells the story of 3 kids trying to escape their fate as unwinds. At first I couldn't get into the novel. The weaknesses to me came from the dialogue. There are a few times when they have these one liners that can get a a bit corny and contrived, however as the book went along I was sucked in too much to care. My favorite character in this novel has to be Lev because the journey he goes through is pretty amazing. Shusterman's website is Storyman.com and for a good reason. He knows how to tell a good story. While the environment Unwind takes place is very similar to our world t, he makes it interesting by populating it with people who are tithes, unwinds and clappers (but you'll find more about that if you read the book). One of the creepiest things about this novel is the epigraphs set between the chapters that are from real life news articles and events. They set this image in your mind that the universe in Unwind is entirely possible. I'm sure some people will get their minds wrapped around the question of is this a pro-choice or pro-life novel. I'm sure Shusterman is asked this alot. In my opinion at times you would think it was more of a pro-choice novel, but I think the real message is something more. It says; look what will happen if we all don't stop fighing. Look who really suffers. With plot twists, shock value and an epic journey this novel is sure to please. 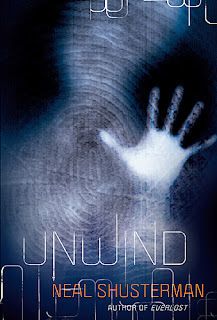 I'm pretty excited that after 5 years, Shusterman is writng a sequel (some believe it is a prequel) called Unwholly in 2012. There is also a link one his website to the movie site, but I am more interested in the sequel. This sounds really awesome! Thank you for sharing about it, I hadn't heard of it before! I loved this book. Creepy and original and it seems possible. Can't wait for unwholly.